Bodmin Town won the Cornwall Senior Cup for the fifth time in seven years as they crushed Godolphin Athletic 7-0 in the final at Treyew Road. Andrew Neale hit a second-half hat-trick, Steve Bowker scored two and Adam Carter and Shane Jewell also netted. Bodmin are still on course for a Cornish treble this season. They are unbeaten at the top of the South West Peninsula League (SWPL) and face either Godolphin or Launceston in the SWPL League Cup final in May. 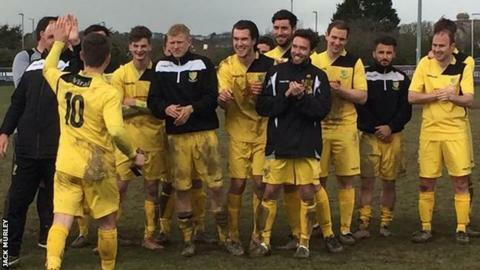 "They deserve it, they've been a great bunch, they've worked hard for me, the club and everybody," Bodmin Town manager Darren Gilbert told BBC Radio Cornwall.